HR Cloud works seamlessly with the tools you already love, so that you can accomplish more, together. ADP provides payroll services, offers benefit administration and retirement services. Accounting applications that accept business payments, manage and pay bills, and payroll functions. Seamlessly integrate HR Cloud with UltiPro, an HCM solution for financial, healthcare, retail and manufacturing companies. An applicant tracking system made to streamline hiring. Recruit automatically syncs hired employees through Onboard and into your HRMS. Industry leading SaaS recruiting software and talent management systems for both the corporate and staffing industries. Greenhouse Software designs applicant tracking systems and tools that help companies hire the right talent. A powerful, and affordable recruiting software that is purpose-built to help growing companies exceed their recruiting goals. Checkr's background checking software uses advanced artificial intelligence technology to better classify records without jeopardizing compliance. People Matter. Make Good Choices. We consistently deliver fast, accurate, affordable and compliant information. Eliminate username and password hassles with Okta. Access HR Cloud using your existing corporate credentials. OneLogin™ cloud identity management platform provides multi-factor authentification, directory integration with AD, LDAP, etc. HR Cloud integrates with Indeed, the number one jobsite in the world, to make finding qualified talent easier. ZipRecruiter is a leading online employment marketplace powered by AI-driven smart matching technology. A real-time performance management system is simple and seamless with Engagedly, featuring single sign-on and batch employee data transfer. Use this integration to sign up and sign in to HR Cloud. Sync your Google contacts with HR Cloud. Sign up and sign in to HR Cloud with Office 365.  Integrate and sync your Office 365 contacts with HR Cloud. LinkedIn is a business and employment oriented social networking service that operates via websites and mobile apps. Simplify time-tracking, employee scheduling and payroll by integrating HR Cloud with Tsheets. Use this integration to sync your Google calendar with HR Cloud and see who is in and out of the office. Synchronize your HR Cloud social stream and user notifications to Slack channels. We’ll follow up with more information on how HR Cloud can help bridge all your favorite applications.